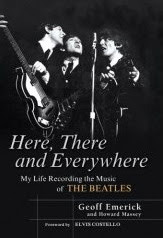 I recently completed Here, There and Everywhere by Geoff Emerick and Howard Massey. If you're a Beatles fan (not the kind that collects Lennon's used kerchiefs or anything), it's definitely worth the read. To start with, I should say I really dig the Beatles. Why is this important? Because their music wasn't my gateway drug. It was a book entitled The Love You Make by Peter Brown and Steven Gaines. That led to my purchase of Revolver, and then I got ahold of Sgt. Pepper. One day my good friend's pops asked me about my Beatles awakening. I told him what book did it. It was, in fact, from his very shelf. He gave me a slight wizened frown and said, "I have the best book on the Beatles ever written. It came out recently. I'll lend it to you, and I never lend my books, so you have to promise you'll return it." With that, he oh-so-delicately entrusted me with Here, There and Everywhere. It still had that new-book smell. I read it. Slowly. Then, as promised, I returned it. I do think it was the best book on the Beatles ever written. And even if it weren't, I'm sufficiently satisfied with the perspective presented that I'm not off mongering for other ones. 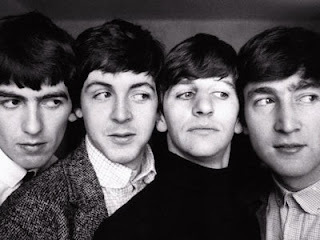 The Emerick narrative, attentively shaped by Massey, betrays an intimacy with the Beatles that stems from both a technical viewpoint and a time investment that was not always pleasant. He doesn't lend the sense that he's writing about them because he was star-stuck, and he wasn't unduly officious about his position in their world. What's more, there's no parsing of public rumours or sordid details, no pop interpretation of what must have inspired their songs. Emerick's craft, and Massey's construction of the tale that shaped it, are the true gems. The Beatles, their hectic world and their playful experiments with people and music are examined with the same technical lens as was used for their albums. But there's feeling, too. Geoff's life and craft were impacted significantly by the Beatles' travails, and the gravity of his experience rises out of the sum of those parts. The book is clearly not just about them. It's about him, too - possibly most of all. After I read the book I picked up Abbey Road. It's the album I like best, and it probably wouldn't mean so much if not for Here, There and Everywhere. Hats off to Massey and Emerick. Warren Buffett, nurturing gardener of Berkshire Hathaway, is making good-bye preparations. And while he's the first to admit he'd hate to retire, the 76-year-old CEO and chairman is aware the time to descend will come whether he wants to or not. Details of the retirement are hush-hush but he did mention he'll be trying some hirees on for size in the coming months. The only position explicitly covered is that of chairman, which will be adopted by son Howard Buffett to preserve the Berkshire culture. Potential shoe-fillers should prepare to be paid by investment performance, not title (read: phantom phallus) size. And if said candidates aren't too keen on Omaha, they can expect to live "wherever they feel best about life. Wherever you can think best, the information is readily available," confirmed Buffett. Dire topic matter aside, the Oracle of Omaha is chipper. "I feel terrific. You ought to try this peanut brittle," he said during a news conference. A box of candy sat between himself and Charlie Munger, whose role as vice chairman will not be filled. 83-year-old Munger is rolling with that choice in good humour. "I do not need to be replaced," he said. "If you fade away, you do not need to be replaced." After all that rag the homies moved onto business as usual, mentioning in passing they're over their railroad prejudices, among other things. I'm fond of Buffett and Munger (something you probably already know about me) and am consequently bummed, though I've often wondered what sort of hell will break loose when the big men leaveth. Glad we're all being practical here. Advertising Age had this article about leaving work behind and going on vacation. It essentially revolves around the freak-out experienced when departing one's responsibilities for - dare we say it? - three weeks or so. Statistically, Americans get the least vacation time of most any country. Just ask Expedia. No, but seriously, we do. And last I checked, we're among the most paranoid people ever when it comes to leaving our work behind. My cousin, who's taken up marketing at DriversEd.com, called me in a mild panic because of an upcoming planned vacation he discussed with the HR manager before he was even hired. She OK'ed it; vacations happen, whaddaya do. But yesterday he demanded, in a tone that hardly elicits an answer, whether I think he'll still have a job once he returns. "Dude, it's two weeks," I said. "You're good at what you do and nobody else is doing it. Why wouldn't you have a job?" There wasn't much of a response on his end, and that's okay because he's reacting to a feeling that's common but irrational at heart. Americans are the least inclined to take advantage of their paltry vacation time. One can argue it's because we love what we're doing just that much, but we're probably just scared our bosses will realize they perhaps don't need us much after all. This doesn't happen. So take your vacation, chuck your e-mail and relax. And in the unfortunate event that you do not in fact have a job when you return, hey. Go build value with people who really deserve you. Above all things we need to take care of ourselves. It's my firm belief that "tendering oneself," as Shakes' would say, yields the max benefit of our productive potential. This is a lengthy segue to what I actually popped in to talk about. Think it's hard to take a vacation? Try leaving the nine to five entirely. Like, forever. Because, after a long (read: endless) period of deliberation, flip-flopping and completely insane priority-juggling, I've just done it. I love DriversEd.com and I think my time there was well-spent. In conjunction with the people I worked with (the people I saw most for all of three years! ), I got to do and be part of some amazing things. This company guided my professional development - and dealt with me, rain or shine - all through college. When I left, the marketing department was three times bigger than it was when I started. The clients, pet projects and whatever else I left behind (a stuffed fish named Lyle, for example) are all in good hands. Leaving a place, especially one to which you feel you owe so much, is frightening. So why did I quit? What am I doing now? I'm doing what I said I'd do in high school. I'm writing. About ads and technology. 24/7. I mean DriversEd.com was great, but now life is a magic sandwich comprised of everything I love, in concentrate. And this is just the beginning of a much grander adventure. Because we spend so much of our lives in fear - fear of taking a break, fear of leaving someplace, fear of committing, fear of disappointing somebody. Fear is mostly just us. Sometimes we need to squeeze our eyes shut and leap. When we do what's right by us, inevitably we produce more for others. Plus, people respect you more for it. In other news, guess what? I'm moving to Ithaca to dabble easterly and get a broad broad feel for the wide wide world. I am stoked.